Whether you fall or fail, whether you cry or sob, all you can look forward to is that your dad believes in you. He picks you up, brushes you off, and lets you try again. The best thing a father can do for his baby, is to love his mother. Fathers are angles, without father the world seems to be nothing. I love you papa I miss you very much. Your father may have passed away. But you can still look up to the sky and wave goodbye. You can’t forget him no matter what. But at least the sky has one more angel to say hi to. Love and miss you dad. A man can have many children, but a child can only have one father. A happy family needs a loving and caring father, and he who knows how to be a mother sometimes. A happy family is a reflection of a good father and a loving husband. 9) A little bit of dirt never hurt anyone. 8) Go ask your mother. 7) Were you raised in barn? 6) You don’t know what hard work is. 4) Don’t make me stop this car! 3) You’re grounder till you’re thirty. 2) Money doesn’t grow on trees. 1) Because I said so. That was when the world wasn’t so big and I could see everywhere. It was when my father was a hero and not a human. A dad is someone you never outgrow your need for. 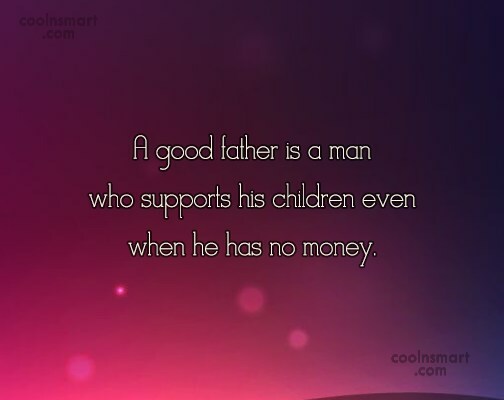 It’s easier for a father to have children…than for children to have a real father. A dad is your biggest fan, even when you strike out.